For the past few years I've been obsessed with Bath & Body Works 3 Wick candle in the fragrance "Spring." I would literally say that it's the epitome of spring, fresh and a little bit of something like freshly cut grass, it's just perfect for when it finals starts getting a little warmer. I was gutted to see that Spring wasn't released again this year, in fact, it was literally shock that I experienced as it's been around for the past few so I took it for granted. That aside I was delighted to smell their candle in "Happy" and although it's not exactly the same as "Spring" it's still on the same lines. Happy is meant to smell of daisies and a hint of Jasmine and it really does. The scent throw is pretty good, Id probably rate it an 8 out of 10 and it fills my home with fragrance. 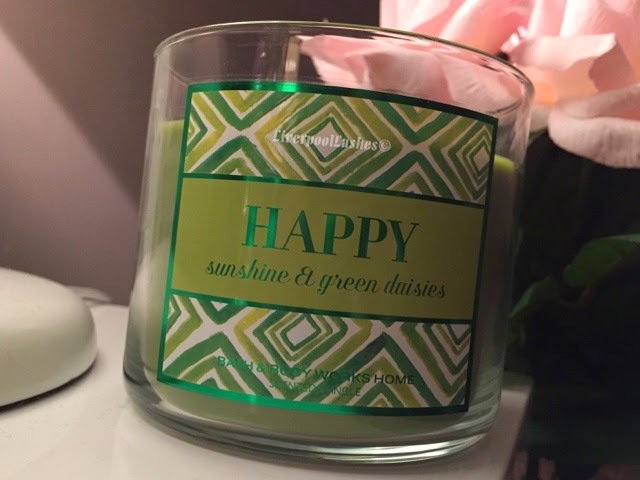 The bottom line is, if you loved the Spring candle then I highly recommend Happy as an alternative. It's fantastic.